Australia First Party chairman Jim Saleam was a guest speaker today at an event honouring murdered Russian diplomat to Turkey, Andrei Karlov. He was joined by Hellenic Nationalists of Australia chairman Ignatius Gavriilidis at the commemorative address outside the Russian Consulate in Sydney. The event was organised by Simeon Boikov, the chairman of the Zabaikal Cossack Society of Australia. 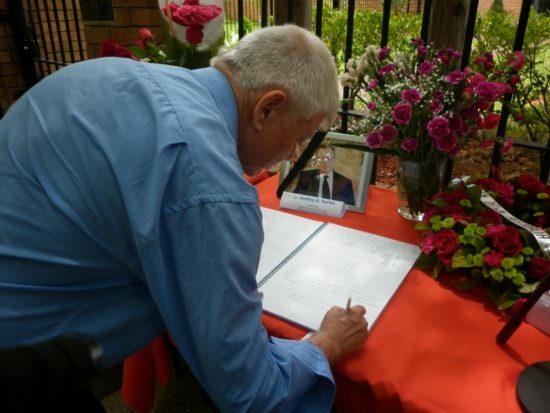 AFP President, Dr Jim Saleam, signs the condolence book.on behalf of Australia First Party outside the Russian Consulate in Sydney. It is in memoriam for the murdered Russian diplomat to Turkey, Andrei Karlov. Australia First Party chairman Jim Saleam was a guest speaker today at an event honouring murdered Russian diplomat to Turkey, Andrei Karlov. 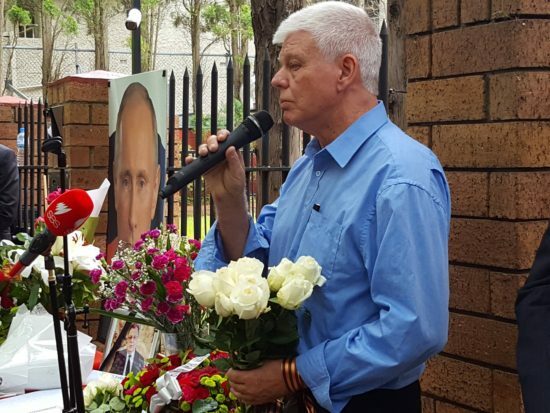 He was joined by Hellenic Nationalists of Australia (Golden Dawn) chairman Ignatius Gavriilidis at the commemorative address outside the Russian Consulate in Sydney. Members of the Russian community — some in full Russian military regalia — as well as representatives of the Turkish (yeah, what a cheek), Serbian, and Palestinian communities expressed their sympathies and showed support for Russian president Vladimir Putin and the Syrian government in their fight against western-backed terrorists. A group of rugged Russian bikers also turned up to pay their respects. Dr. Saleam and Gavriilidis joined other speakers as they wore ribbons, signed the book of condolence, and laid flowers at Karlov’s makeshift shrine while watched by a busy media contingent including RT and SBS. Karlov was gunned down on December 19 while addressing an exhibition at an art gallery in Ankara, Turkey. The shooting happened at point-blank range as Karlov delivered his speech before a contingent of media. His assassin was 22-year-old Mevlüt Mert Altıntaş, an off-duty Turkish police officer who can be seen on video shouting “Don’t forget Aleppo, don’t forget Syria” and “Allah Akbar” while waving a gun. He was shot by Turkish security forces and later died. We have Trump to thank for liberated scenes like this… oh, AND Putin! Ignatius Gavriilidis offered his sincere and heartfelt condolences to the Russian nation on behalf of the Hellenic Nationalists Australia and Golden Dawn Greece, condemning what he angrily called the “barbaric act”. He exclaimed, “We stand by Russia who is heading the front against the violence in the Middle East! We also definitely wish to see peace among the Syrian people”. He called for Australians to unite to impress upon all Australian politicians and leaders that “the real fight against terrorism is being carried on by Russia and not by Australia and its so-called allies”.